The first alarm sounded just after midnight on April 27, 1924. Lowell’s firemen arrived soon after to find tendrils of smoke wafting from the Associate Building’s fourth floor windows. Inside, the Portuguese Club was ablaze. By the time firemen gained access to the downtown Lowell landmark, they found the fire well underway inside and quickly sounded a second alarm. As one o’clock in the morning approached, a general alarm was sounded and help was called in from Lawrence and Dracut. The Associate Building was well worth saving. Built more than thirty years earlier, it was set on the corner of Merrimack and Worthen Streets, in the heart of Lowell’s downtown, overlooking City Hall and Monument Square. By 1924, its five stories of yellow brick housed the Brockton Shoe Store, the City Hall Drug Store, Freeman & Co. Clothiers, as well as several dentists, tailors, and chiropractors. Its basement even had its own bowling alley. 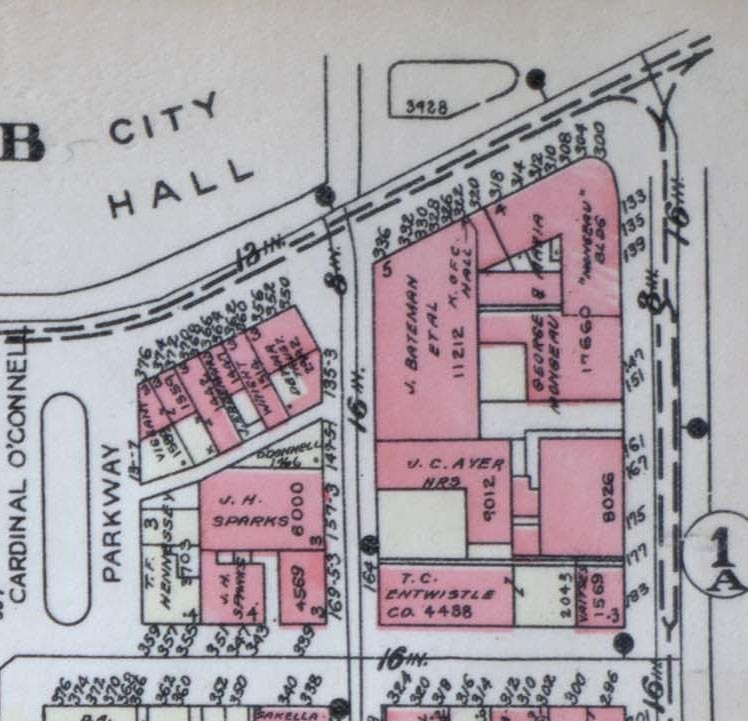 In this excerpt from a 1924 Lowell City Atlas, the lot where the Associate Building stood is marked with “J. Bateman”. As the hours wore on during that late April morning, Lowell’s Monument Square was filled with clouds of sparks and smoke as the Associate Building burned. Lowell’s fire department fought the flames from the ground, from ladders hoisted against the building, and from inside the building. Lowell’s Engine 3 streamed water from inside the Associate Building’s fourth floor dance hall. Lowell’s Engine 6 fought the flames from ladders outside, far above Worthen Street. They were making progress. The fire was coming under control. Until the massive hot air explosion. In that flash, firemen inside were blown back into a hallway, against walls. Some were thrown flat on their backs. Outside, Hoseman John W. Gray, atop the ladder at the time of the explosion, was hurled, ladder and all, across Worthen Street into the brick wall of the opposite building. His life belt saved his life, but still left him with multiple injuries, including a broken nose. He was sent to St. John’s Hospital for treatment. His Captain, Edward Cunningham, didn’t fare as well. The explosion crushed Captain Cunningham under a falling wall of bricks. His fellow firemen risked their lives as they pulled him free from the rubble. He was still conscious when they loaded him into the ambulance bound for the Lowell Corporation Hospital. His comrades later learned that he died before he ever got to the hospital. In the wake of the explosion, all men were recalled from the building. Moments after their escape, the walls and floor of the hall where they had been failed. The truck that had hoisted Capt. Cunningham’s ladder was split into two from the force of the explosion. Its engine had been crushed into its front wheels. Some men were temporarily trapped in the building. Others had to be pulled from the rubble in the street. The explosion also spread the flames far beyond the Associate Building. In moments, the Academy of Music building and Sparks’ Stable were now seriously threatened. Soon, the fire threatened the entire area bounded by Merrimack, Dutton, Market, and Worthen streets. It became clear that the Associates Building was a total loss. The Sparks’ Harness Shop was declared a lost cause not long after. Despite the early hour, crowds began to gather and saw that the Academy of Music building, the Kennedy Building, and the Knights of Columbus Building were starting to smolder. Sparks’ Stable and the Mongeau Building weren’t far away from the flames either. Another wall of the Associate Building collapsed and hit Sparks’ harness shop. A gasoline pump outside Sparks’ blew up in a burst of flame, but the tank stayed intact. Another wall collapsed and destroyed Kennedy’s Building. Soon after, the Academy of Music, all three of its wooden stories, caught fire, and burnt quickly. H. P. Hood’s offices, on one floor of the building, were completely lost. Soon after, the flames jumped Dutton Street, from the Academy of Music to the wooden Knights of Columbus building, which had once been the First Trinitarian Congregational Church. Firemen fought to save the building. In the end, they did succeed in saving the building’s stained glass windows. The firemen from Lawrence finally stopped the flames from advancing any further toward Market Street. The firemen directed their streams at the Mongeau Building, which was starting to smolder. Ladder 4’s Herbert Cogswell fought valiantly before collapsing on the building’s top floor. George Hurley was later overcome in the same battle. Both were sent in clanging ambulances toward St. John’s Hospital. As the Mongeau Building was saved, the YMCA building across Dutton Street started to receive its own showering of sparks. Lodgers were drafted right out of the line of those removing their belongings to form a temporary brigade to wet down the building. Their efforts saved the YMCA from certain destruction. One close call occurred when Sparks’ Stable, which housed some 30 horses belonging to the H P Hood Company, started to spark and smolder. An ambulance driver and a patrolman battled pandemonium as they removed the horses from the burning stable. Nervous store owners watched the sparks shower down across the downtown. As far away as Shattuck Street’s Lowell Electric Light Company, an awning caught fire. One man, never identified, was saved from a wall of falling bricks when he was pulled into a doorway by Lowell Patrolman John Mahan. In the end, ten firemen in all were sent to city hospitals with injuries from the blaze. Even more suffered minor injuries. The fire was then the largest in the city’s history. Every available piece of equipment in Lowell, two companies from Lawrence, and two from Dracut arrived to fight the fire and each was fully needed. Despite their efforts, the fire changed Lowell’s streetscape forever. The Associate Building, the Academy of Music, and Sparks’ Stable were all total losses. The Knights of Columbus building and the H P Hood Building were both considered beyond repair. At one point, the blaze grew so hot that the glass on City Hall’s clock cracked. 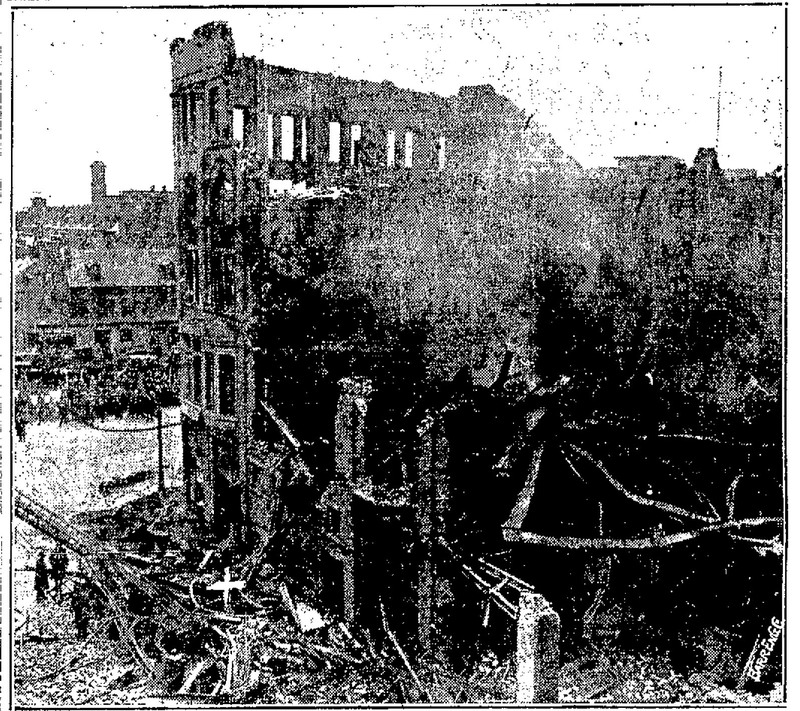 The damage was so complete that the Eastern Massachusetts Street Railway would not run its cars past the ruins of the Associate Building until its ruined walls were taken down that day after. Captain Edward Cunningham of Engine 6 lost his life fighting the fire. Appointed to the force in 1911, he was promoted to Lieutenant in 1918, and to Captain in 1922. He had earned the respect of Chief Saunders, who described him as a “splendid young man, of a clear and sterling character”. He was remembered as a fearless and courageous firefighter, who had headed the movement to educate school children on fire safety. In his final minutes, Capt. Cunningham was offered religious solace from the popular Rev. Appleton Grannis, of St. Anne’s Church. Cunningham, a Catholic, was comforted by the Episcopal clergyman until Rev. Dr. McGarry of St. Patrick’s Church arrived to administer last rites. Captain Edward Cunningham left behind a wife, Helen, and three young children, Leo, Helen, and Pauline, all under ten years old. The Cunningham Family, as shown in the 1920 census. Their youngest daughter Pauline had not yet been born. John Gray was my great uncle. He was so proud to be a firefighter. He left us a few scrap books with many pictures and articles, some of them being from this fire. Some were used in a history book on Lowell Firefighting recently. 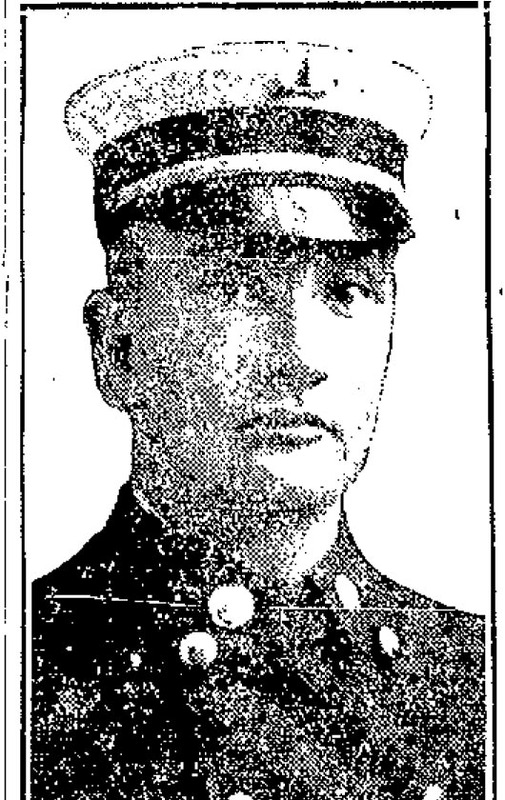 My grandfather Captain Edward Cunningham was killed in the fire of 1924. My grandmother Helen Cunningham went through bad times but remained calm and wonderful for my childhood in Pawtucketville. She died in 1968.
told the entire story. It was a sad time for the family. and daughter Pauline are all buried in Edson Cemetary in a family grave. Rest in peace Grampy your family is with you. My Great Uncle John Gray had a photo of Edward in his scrapbook. The exact one that is attached to this article. Very interesting article, but I would like to make one correction: the fire started early Sunday morning, April 27, 1924, not April 28. Nice catch, Jane. I looked it up in the Sun, and you’re right. I’ve updated the post. Thank you!